The United States Supreme Court was not that impressed with South Carolina’s equalization program, either. Briggs v. Elliott was heard along with four other cases arguing for desegregation from Kansas, Delaware, Virginia, and Washington, DC. Collected together under the decision known as Brown v. Board of Education, the U.S. Supreme Court ruled in 1954 that racial segregation in the public school system was unconstitutional. The Clarendon County parents had won their fight. Despite the Supreme Court’s ruling, nothing changed in South Carolina’s public schools. Black and white students continued to be segregated. School districts continued to plan and build segregated schools. Some African American parents and leaders filed petitions to desegregate the schools in Mt. Pleasant, North Charleston, Columbia, Estill, and Florence, but the petitions went nowhere. Black students in Clarendon County continued to attend school in their new (but still segregated) schools. Finally, in 1960 Clarendon County parents petitioned the court to end segregation. The lawsuit stalled in court, and in May 1962 parents in Charleston and Darlington also sued to end segregation. These lawsuits moved forward once the publically-owned Clemson University was forced to admit an African American student. In September 1963, eleven African American students desegregated Charleston County’s white schools, making South Carolina the last state to desegregate its public school system. Photograph courtesy Charleston Post and Courier. these 11 students attended their formerly all-white schools. 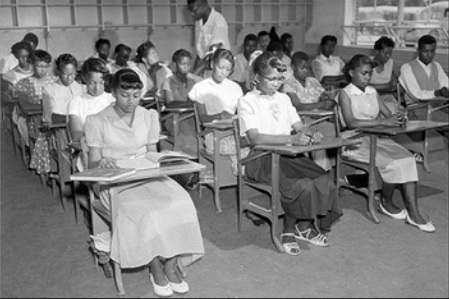 The rest of the African American students attended school in all-black schools, including the brand new C.A. Brown High School on Charleston’s east side, that finally opened in 1962 to relieve crowding at Burke High School. While the color line had been broken, Charleston County (and the rest of South Carolina) continued to run a public school system based on race. 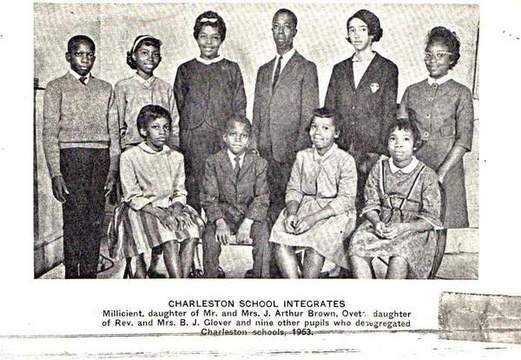 The Lowcountry Digital History Initiative's online exhibit, "Somebody Had To Do It: First Children in School Desegregation," tells the stories of those students who were the first black students in white schools. Desegregation caused many white parents to send their children to private schools. So many private schools opened in 1964 that they became known as "segregation academies." The public schools in the city of Charleston became mostly black. No white students chose to attend any previously black schools. Charleston County School District continued to operate mostly black and mostly white schools until forced to integrate their school systems by the United States government in 1970.